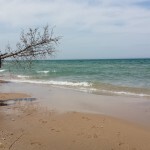 As many Michiganders know or believe — and much of the world nowadays — northwest Michigan is among the most beautiful of places, which is why we chose it for our first practice run with our Salem travel trailer, a.k.a. the WordCamper (WordCamp (WordPress user meetups)) plus travel trailer/campervan equals “WordCamper.” Word up.). As first-time travel trailer owners and operators, we needed some time to figure out how camping on wheels works. From packing up, battening down, managing gear and pulling weight, from beginning to end and everything in between, we had some learning and experimenting to do. For a little padding, we wanted to make a trip within a few hours from our home base, so Manistee, Michigan, it was. According to legend — or to Wikipedia — the name “Manistee” is ambiguously derived from the Ojibwe word ministigweyaa, referencing “river with islands at its mouth,” or from an Ojibwe term, meaning “spirit of the woods.” No one is for certain. What is for certain is that Ottawa villages peppered the Manistee River Valley from 1836 – 1848. The Ottawa successfully drove out Missionaries, but eventually European settlers arrived making way for industry, including logging, shingles and salt. Manistee has a Victorian era architectural history, staking its claim on the National Register of Historic Places. 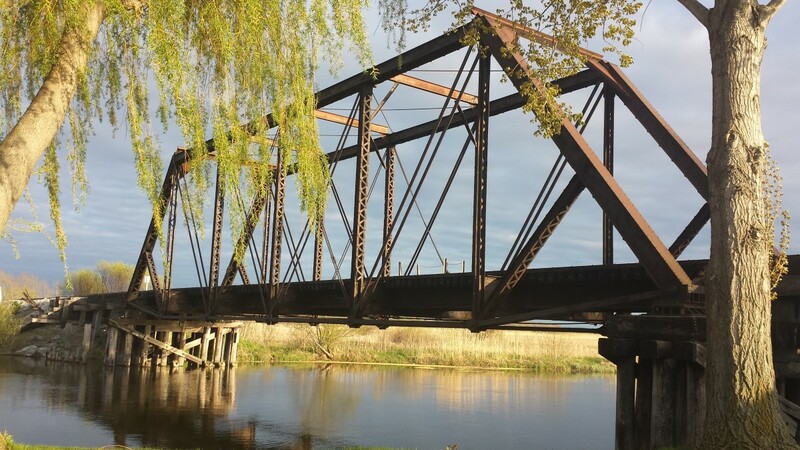 It also is known for golfing, the Ramsdell Theatre, and fishing for salmon and steelhead on the Big Manistee River. 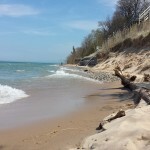 However, of most importance to us was Manistee’s proximity to Lake Michigan, forests and inland waters, and helping us ease into inaugural WordCamping. There were many places from which we could choose. 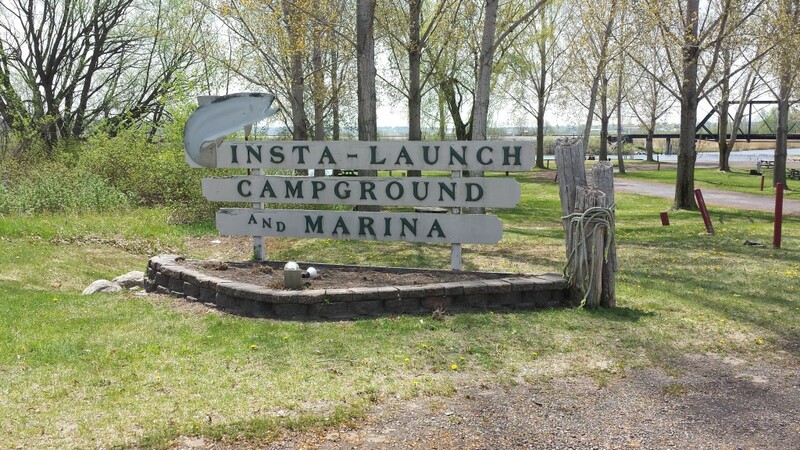 Utilizing maps, personal experience and the Web, we chose Insta Launch Campground & Marina on the Big Manistee River. 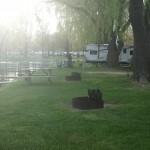 It has not taken us long to realize that choosing a campground among the approximately 100,000 North American public and federal campgrounds can be a bit dizzying. (This number was of my own creation and math, but I think I’m close after researching it all.) 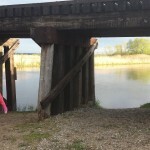 Considering the various campsites in and around Manistee, we chose one with positive reviews, pretty pictures, a helpful website and an interesting name, one that might help us on our maiden voyage at Insta Launch Campground & Marina. It was a very pleasant surprise. Down the line of the camping continuum, one soon learns that there are three phases of getting-to-know one’s campground. There is the initial choosing: what looks good on paper and online and in one’s head. Then there is what one feels upon entry, such as, “What did I just get myself into?” or “”Wooooooow!” Finally, there is the settling in of the rig and adjusting to the camp’s culture, as well as one’s own. We definitely experienced all of the above with Insta Launch. At first, I wasn’t sure what to make of the “Insta” part, but it proved itself online as a highly-rated campground generally, its proximity to water, woods and hiking, while offering all the amenities a family would need for camping in a tiny house on wheels by trial-and-error. Check. Then, as we were locating the campground, we noticed that the surrounding area looked a bit industrial. Were we in the right place? How could a campground and the rear entrance of a body shop coexist? But as we turned the corner and made our way in, it seemed really lovely, this quiet little campground nestled in an inlet of the Big Manistee River, with marshes, docks, a cacophony of birds and their lovely calls, geese and goslings and their not-so-lovely calls (the geese, not the goslings), a substantial welcome center and store, laundry, showers, a marina, yes, and more. There was the ever-present “seasonal” “residence” we’ve come to find in some campgrounds, but everyone was really nice and it is home to them. Camping here would be just fine. Check. Which leads me to that last part about settling into the culture of camping. The most unique feature about Insta Launch Campground & Marina was not the golf cart-driving full-timers, nor the really nice guy that runs the campground, nor the marina as much as it was the train, the Marquette Rail. 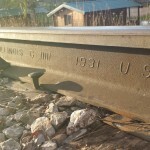 Yes, there was — there is — a working train that runs along the campground, over the river, the old tracks, across the iron bridge, this iron horse towing a long set of enormous, heavy train cars and all. It runs in the early morning mostly, coming in rumbling very slowly, sometimes during the day, working back and forth to hitch-up other cars. It is part of the campground culture. 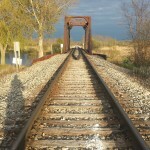 One wakes up to the sun shining on the inlet water, hears the birds sing … and waits for the train to pass. And it is totally cool. 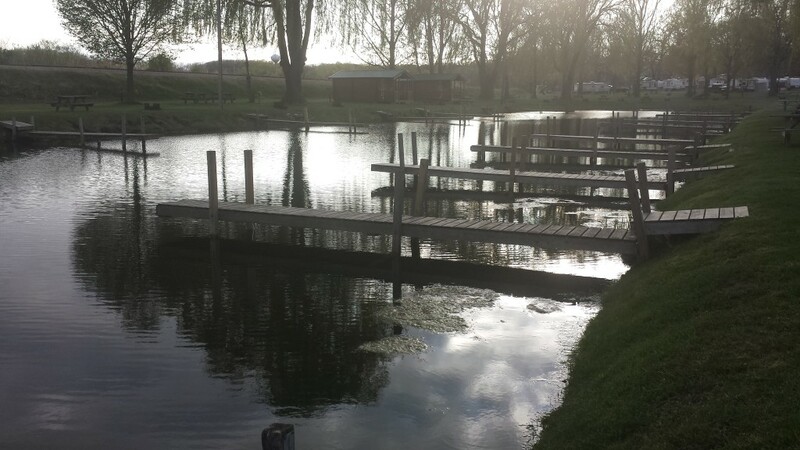 It became something we expected, just like one of our new neighbors driving around the campground campus in a golf cart, kids on bikes, or the protective mother duck nesting in the crotch of the towering willow trees. We had the place to ourselves as we visited off-season, although we met lots of new people. It was so peaceful that I was able to practice yoga and meditate on the dock, and we were able to experience and experiment all of the things needed to figure out how this camping thing goes. 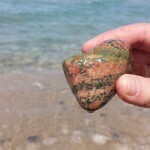 One of our favorite Manistee activities was our hike around Orchard Beach State Park. 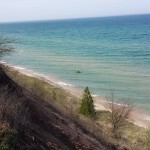 It offers bluff views of Lake Michigan, much different than our lake views in West Michigan; the hike down to the water and narrow(ing) shoreline is steep and worth it. The campground is impeccable. 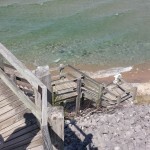 Next time we visit Manistee, I am sure we will stay there. Lovely visit, indeed. We acquired our Salem travel trailer about a month before we departed for Manistee. In that time, we not only were packing and organizing the camper, but we were ridding ourselves of most of our possessions, our residence, storing some of what we want to keep, mentally straining ourselves to keep it all straight. By the time we departed, we were as ready as we could be: we locked down, we hitched, we brought snacks, we towed. Before we reached Manistee — only 140 miles and less than three hours from our home base in southwest Michigan — we had used three-quarters of a tank of gas. What could have missed? For starters, to quote Scot, “It would have helped to have our holding tank situation situated.” We weren’t set up to dump our practice loads at our home. We left late, so we hauled. Next, we felt pretty confident that we were “pretty light.” Just to give you an idea of how light we were not, we compulsively extracted the unnecessary contents from the camper to the back of the truck, filling it to haul back home for redistribution. We will obtain a fishing pole for Luna. Maybe one for me. We will continue to lighten the load. One needs only to build on the most important things in life. Frugality changes the way we think. Maybe we should have brought a second key? This campground recycled cans (probably soda and beer), but nothing else. We are still adding up our expenses. We will post ASAP. Luna: I liked that you can go under the bridge. Park (playground) was okay. Scot: This was a great place for us to break in the WordCamper. Would have been nice if they rented fishing poles, but I bet that is a huge hassle for the front office. Liza: I like the proximity to the train, the tracks and the bridge. 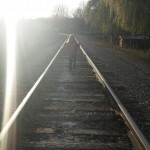 It was fun to walk the tracks with Luna, and the setting sun offered amazing light. 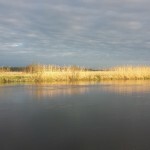 I also liked the peaceful setting the inlet offered, as well as the active bird life in and around the marshes. 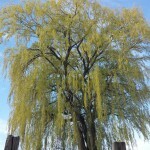 View of the precious willow tree from my yoga mat. Lake Michigan from the bluff at Orchard Beach State Park. Rumery’s – congrats on your maiden voyage. Your website is awesome. We have enjoyed, and look forward to your travels.